Sugar Ridge is a hotel featuring an inclusive plan, nestled into a natural hillside bordered with sugar cane in beautiful Antigua. 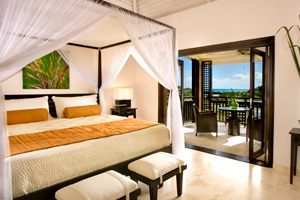 Sugar Ridge is a luxury, boutique hotel that captures the most stunning and panoramic views of palm lined beaches, the turquoise Caribbean Sea, and the neighboring islands of Redonda, Nevis and St. Kitts, which sit like gems on the horizon. Sugar Ridge was voted one of the Top 25 Trendiest Hotels in the Caribbean on Trip Advisor, the only hotel in Antigua to earn this recognition. Family-friendly and relaxed, this resort is one that is sure to be a memorable stay for all ages. Sugar Ridge hotel is situated on the spectacular west coast of Antigua and is nestled into a natural hillside bordered with sugar cane. 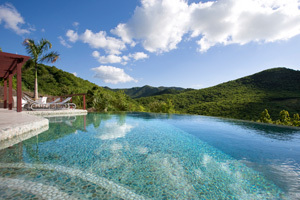 Sugar Ridge is a new luxury boutique hotel and with its elevated position, captures the most stunning and panoramic views of palm lined beaches, the turquoise Caribbean Sea, and the neighboring islands of Redonda, Nevis and St. Kitts which sit like gems on the horizon. Sugar Ridge was voted one of the TOP 25 trendiest hotels in the Caribbean on Trip Advisor, the only hotel in Antigua to earn this recognition. Breakfast is included daily or choose the Inclusive Plan (all meals and beverages) at time of booking. An optional dinner plan is also available. All guest rooms are grouped into sets of four, each with its own entrance and radio frequency activated door locks. The unique groupings and wonderful landscaping provide privacy, yet each has a spectacular view. The upper floor rooms have a large veranda, dining deck and day bed, and the lower floor rooms have similar facilities plus a private plunge pool. A romantic muslin draped king sized four poster bed is the centerpiece of the guest rooms, and the interior designer has made clever use of natural tones, contemporary styles, colonial accents and rich, dark woods. State of the art amenities and technology including iPod dock, electronic safe, LCD flat screen TV and complimentary Wi-Fi internet access are available in each room. NOTE: For families with young children, a specially priced upper floor twin-bedded connecting room is available accommodating up to 2 children 2-12 years of age. Includes: Marriage officer fee; registration and High Court fees; wedding coordinator; decorated wedding arch; bouquet and boutonniere; wedding cake for up to 6 persons; and one bottle of house champagne.